Getting all the information to troubleshoot an IT issue can be painful, both for end users and the help desk. SpeedTicket, by Spadafy, allows your end users to press a single button and automatically gather log files, environment information, screenshots, and files that the help desk needs to troubleshoot an issue. This helps users submit quality tickets, and reduces the time to resolution. With less back and forth on information gathering, your help desk and end users are both more productive! Screenshots, logs, environment variables, system state, and more are automatically gathered on ticket creation. 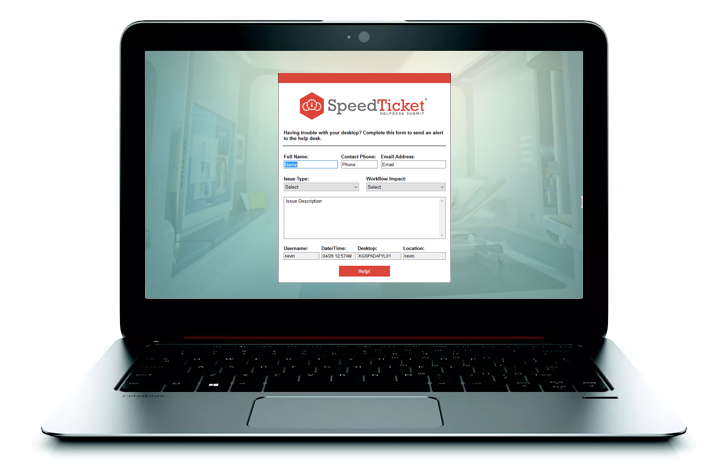 SpeedTicket interfaces with almost any ticketing system. If you don’t have one we can help with that too!